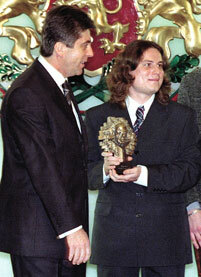 Bulgaria’s President Georgi Parvanov presented for the first time the yearly John Atanassoff award given for special achievements in the filed of computer engineering. The first laureate of the prestigious award is Preslav Nakov from the town of Veliko Tarnovo. Parvanov announced the setting up of the award in October. He also said that it will be presented annual to young Bulgarians that showed great achievements in the computers and informative technologies. In the beginning of October Bulgaria’s President Georgi Parvanov led a special ceremony to inaugurate a monument of the modern computer inventor Bulgaria-descended John Atanasoff. John Atanasoff Junior was also present at the ceremony. John Atanasoff, who is son of a Bulgarian immigrant from Bulgaria’s village of Boyadjik in the Yambol Region, built the world’s first electronic digital computer at US Iowa State University during 1937-42 together with his assistant Clifford Berry. Their creation incorporated several major innovations in computing including the use of binary arithmetic, regenerative memory, parallel processing and separation of memory and computing functions. New Facebook page for the book Second edition available: See list of stores.